Visit any LOFT store in the United States or official website and enjoy an amazing savings! Fall favorites (full-priced styles) are now on sale. 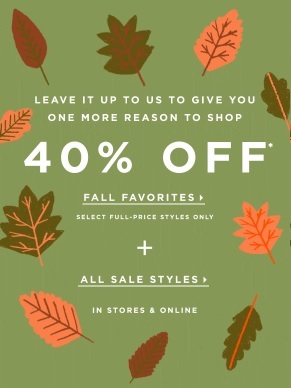 Possible to save 40% off retail prices. Plus, sale styles are still available for shopping. Source of the information is LOFT. More details about the offer available at your nearest LOFT store or on the official website.